I have to say that until this first full week of unemployment, I’ve had a pretty minimal interest in Pinterest. This week, I thought back to a party I went to…maybe it was a Grease 2 party…maybe no other guys showed up so I was the only guy at what wound up being a girl’s night. Anyway, everything served at the party was created from a recipe found on Pinterest. So I wondered what kind of paleo/primal recipes I could find on there. I did a search over the weekend and I found several recipes. I made several of them this week and my review is below. If you click on the small images below each title, you’ll be taken to the pictures pinned on my Pinterest page. Once there, you’ll need to click the larger Pinterest image to get to the actual recipe website. This first recipe comes from apronstringsblog.com and I found it right on time. I needed something new for breakfast. It’s simple to make and tastes really good. I made this on Tuesday morning for my father and we enjoyed a little variety for once. This recipe comes from Health-Bent.com These are incredible. First, I’d like to point out that Emerald has a version of these on supermarket shelves. Their version contains Dry Roasted Almonds, Modified Food Starch (potato), Natural and Artificial Flavors, Cocoa Powder (processed with alkali), Salt, Acesulfame Potassium and Sucralose. This homemade version only uses egg white, water, cocoa and sugar. Now since I don’t eat processed sugar and the recipe creator suggests using powdered sugar, I grabbed my mortar and pestle and some turbinado sugar and started grinding the crystals into a powder. This allowed me to replace the processed sugar with raw cane juice and I feel better about that. These take 5 minutes to prep and 10 minutes in the oven. An almond by itself is approximately 7 calories. Adding the other ingredients only takes the count to 9 calories per almond. I also tried my own version by making my own cajun blend and replacing the cocoa and sugar with that. 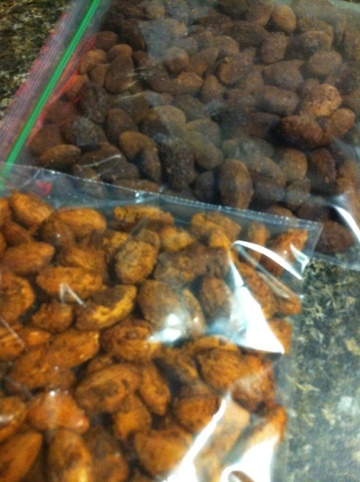 10 minutes later I had cajun roasted almonds that were salty and a little spicy but a great snack. The herbs, salt and spices were so low in calories that it didn’t raise the count per almond. This version is only 7 calories each. So you’re telling me there’s a way to have a primal/paleo pizza as a splurge once in a while? I’m sold. 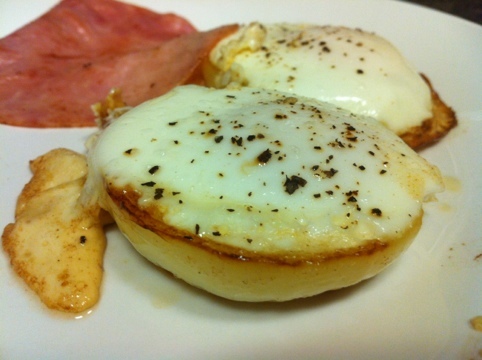 This recipe comes from FastPaleo.com and involves using coconut flour, eggs, parmesan and herbs to create mini flatbreads. I also think these would work well as small primal herb crackers. 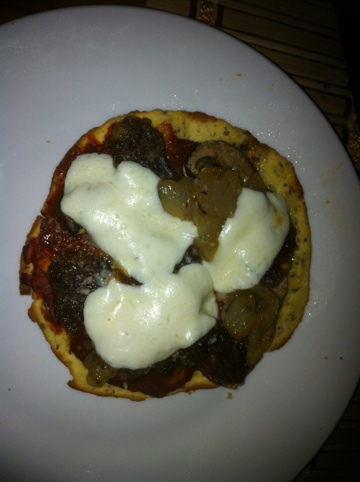 The recipe on Fast Paleo uses blue cheese and red onions as toppings. My friend Jennifer(in the midst of her Primal Blueprint 30-day challenge) came over the other night to help me with a computer issue. 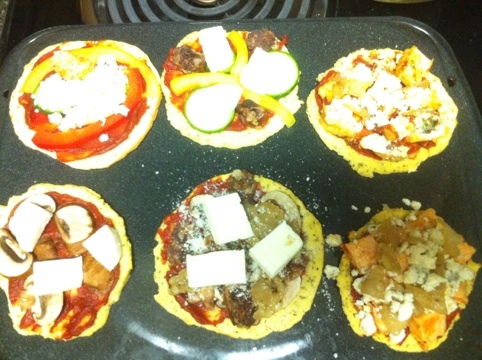 I made a bunch of crusts and put out grilled buffalo chicken breast, blue cheese, fresh mozzarella, caramelized onions, veggies, all-natural sausage and other toppings and we were about to build our own mini pizzas. So there you go. Some great recipes found on Pinterest. If you’d like to see my Primal Recipes Pinboard, just click here. I’ve been updating it a lot more lately. Things are pretty good lately. I’m still locked into my exercise routine each day and I’m eating clean and sticking to the 30-day challenge. I’m so ready to be down in the 270s! Stick around for weight updates tomorrow!